I made an impulse purchase this past week immediately after finding about BuoyRR’s RECHARGE/HER, an immersive dance performance, on the Creators Project blog. 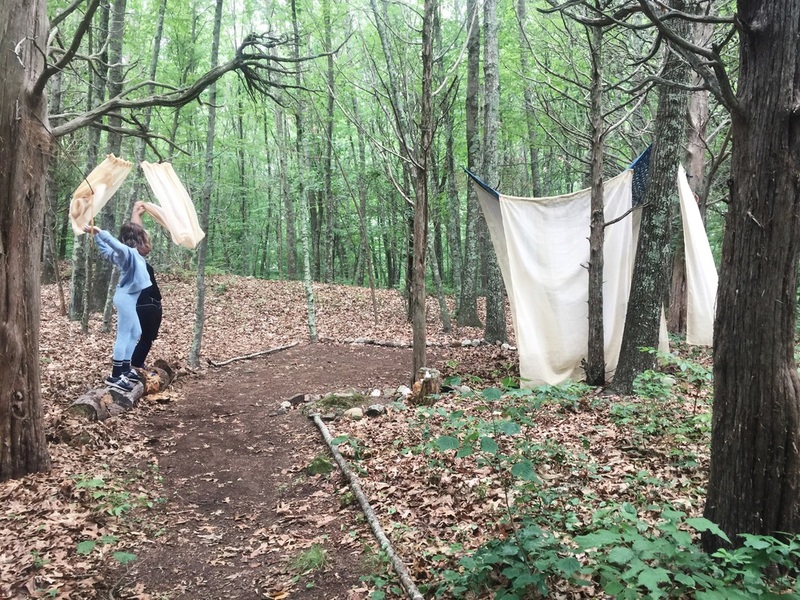 The performance is a culmination of the collaborative work created by 17 artists during the BuoyRR residency, which is led by founders Bailey Nolan and Viva Soudan at The Peace Barn sanctuary in Deep River, Connecticut. I convinced my BFF Alicia to come with me. The bus was the fanciest one we'd ever been on, with hardwood floors and leather seats. We secured the front seats that included a table. Moments later, a woman dressed in a blue outfit arrived and said she was our bus camp counselor. Her name is Ellen Robin and she made the bus ride part of the experience: she brought glitter, face paint, and googly eyes for us to decorate our faces and lanyard materials and yarn for hair wraps. I was down to get into the whole experience so after Ellen told me how to do it, I made one for Lish. The ride went by quickly, as there was no traffic and lots of wrapping to do! When we arrived at The Peace Barn we were greeted by friendly faces and got settled in. For the actual performance, Bailey and Viva led two groups of about 30 people where we were required to remain silent. It was a really beautiful, meditative experience. It’s not often that one has the opportunity to experience a performance not just in a forest, but walking through one. 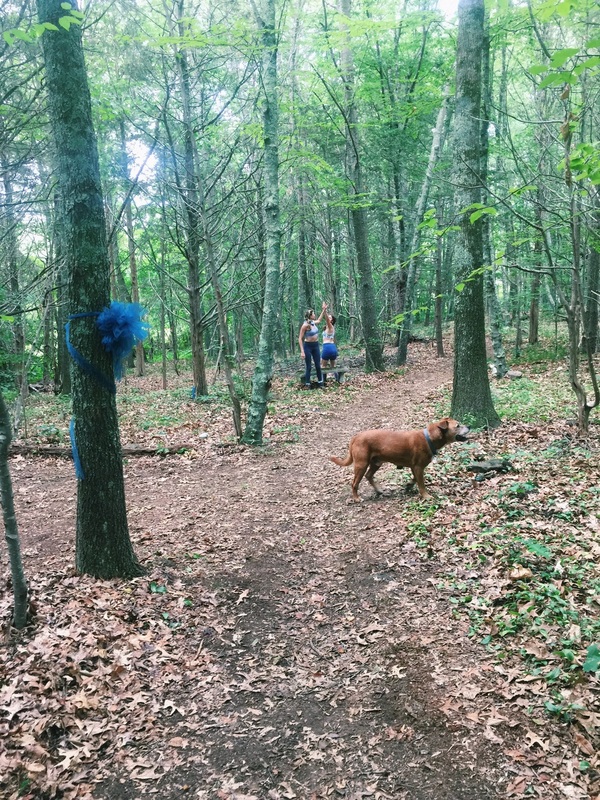 We were guided through a nature walk of sorts, where instead of encountering wild animals, we saw duos and trios performing site-specific phrases on repeat. Each group had their own individual costuming yet aligned with the group’s blue color theme. The rain would start and stop and it made the whole experience even more unpredictable. Some performers interacted with the audience, putting both performer and observer in a more vulnerable place. The walk lasted nearly 3 hours and afterward we had a chance to meet people and eat lasagna. The whole experience was so memorable and I’m happy to learn that a place like BuoyRR exists! As I've mentioned in previous blog posts, I'm currently focusing on creative process and seeing this performance made me excited about my upcoming intensive, where I'm required to lead an entire day of workshopping. I'll likely reflect on RECHARGE/HER more in the coming days and continue to be inspired! Why does Brooklyn get all the cute coffee shops? !